OWWA Administrator Hans Leo Cacdac explains about the i-DOLE ID recently approved by President Rodrigo Duterte for OFWs. The i-DOLE, OFW Identification Card serves as the "virtual" one-stop-shop. The concept of having an electronic platform that can be used for processing OFW documents, requirements, contributions, etc in different DOLE agencies such as OWWA, POEA, TESDA, and the PRC. The platform includes a mobile app and a website where the OFWs can go. For example, transactions with OWWA like updating OWWA membership, applying for OWWA programs like scholarships, training, livelihood, the benefit for disability or death can be done electronically without the hassle of being caught in the traffic on the way to OWWA offices. The most important thing is that the i-DOLE serves as the central storage of information for each OFWs. With just one swipe of the i-DOLE card, all the records of the OFW can be accessed. The mobile app launching is underway and can be expected to start anytime soon. Admin Hans Cacdac clarified that the i-DOLE card can be availed by OFWs absolutely free of charge. Watch OWWA Admin Hans Leo Cacdac as he answers the questions about the new i-DOLE OFW card in an interview by CNN Philippines with Ruth Cabal. Meanwhile, Admin Cacdac explained that the rebate system program must be subjected first to an "actuarial study" before they can begin its full implementation. In the new charter of OWWA passed on 2016 (R.A. No. 108010, one of the provisions under Chapter 19, Section 54 is that OWWA should issue a rebate for members that never availed any OWWA benefits for 10 years and above as well as their family members. After the actuarial study has been done, the OWWA will release a list of qualified OFWs for the rebate. 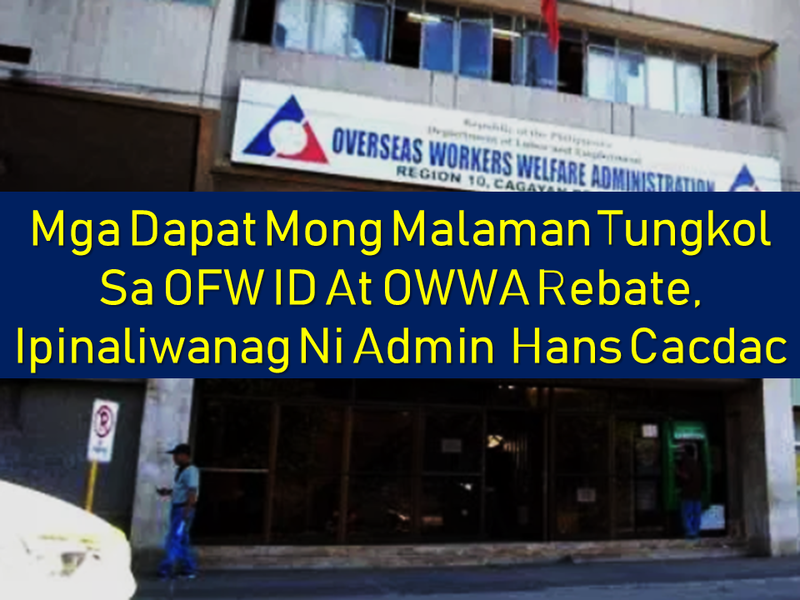 According to Admin Cacdac, his office will advise the OFWs as soon as the rebate program is ready for them to avail.